The Star Wars films have become such cultural touchstones that even the most arcane background minutiae are subjected to intense fan scrutiny. Is Darth Vader&apos;s armor proof that he&apos;s secretly Jewish? 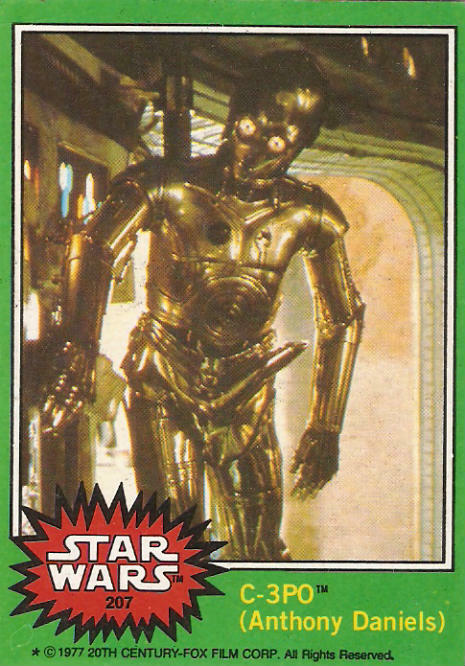 Ditto goes for Star Wars paraphernalia, such as a 1977 Topps trading card, on which a stray piece of costuming made C-3PO look incredibly enthused to be aiding the Rebel cause. Just how enthusiastic was the droid about defeating the Empire? Let's just say that Threepio was upright with martial vigor. Our story starts with the fourth series of Topps' American Star Wars trading card set. The offending card — #207, a.k.a. 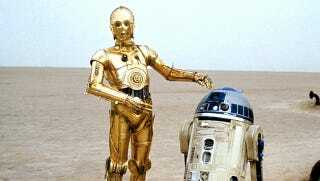 "C-3PO (Anthony Daniels)" — shows the robot flaunting what appears to be a decidedly tumescent member. Perhaps it is a clandestine Jedi antenna that rises in the presence of nearby Force-sensitive individuals? We honestly cannot say, as Topps nixed this particular card once absolutely everyone — save the living caricature of a sleepy Old West sheriff who was mysteriously hired to run the printing press — noticed. Neither the lewd nor corrected card are particularly rare. The bedroom wrestling version of #207 goes for approximately $20 on eBay. [I]t appears that the extra appendage is not the work of an artist, but rather a trick of timing and light. The untouched archive photo shows the image just as it appears on the card. The current theory is that at the exact instant the photo was snapped, a piece fell off the Threepio costume, and just happened to line up in such a way as to suggest a bawdy image. The original contact sheets from the photo-shoot attests to this. They are not retouched in any way, yet still contain the same image. Whatever the real explanation is, the 'mischievous airbrush artist' scenario simply doesn't fit. — "A Stormtrooper is Blasted!" — "Luke's secret yen for action!" — "Han Solo covers his friends"
— "R2-D2 is inspected by the Jawas"
— "Rebels in the trench!" — "Luke poses with his weapon"
— "A pair of Jawas"
Via Snopes, Laughing Squid, and Star Wars Cards.